It's a String ThingChallenge: Oh Where, Oh Where have my Daffodils Gone? Oh Where, Oh Where have my Daffodils Gone? Somewhere under our 6 inches of snow are the sweet tips of my daffodils. Here is my sweet show and tell of what I got accomplished this weekend with my "Snow Day"!! Hip Hip Hurrah!! I have enjoyed every minute of my personal retreat. 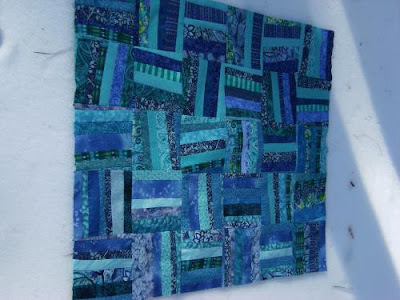 Each block is finished at 5 inches and the quilt top is 30 x 30. These Ice Blue strings are cut wonky and crooked. I still used phonebook pages as my foundation. They too are finished at 5 inches and the quilt top is 25 x 30 inches. I can't wait to get these quilted tomorrow. With the temperature going to be just 10 degrees, you won't see me out on the road. I really didn't know what I would get done with the mess of strings that I posted about on Friday. It seems like I didn't even make a dent in the pile. 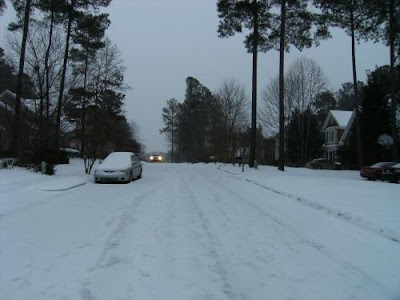 Here is a peek at my street!! Next week I am going to try and use my precious Amy Butler, Heather Bailey, Tina Givens and Kaffe Fassett strings. Ohhh it's gonna be hard. I just love them so!! Love your blocks ! I have a question . When using the white strip did you mark your foundation block first?? I made some string blocks and put a black string in the middle but when time came for sewing 4 blocks together they really didn't match up. Yours look like the match real nice . 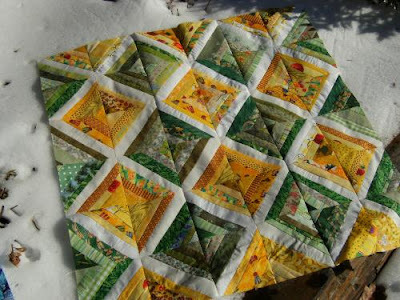 Love that daffodil quilt! I may have to copy your color scheme. The wonky blues are very nice too. 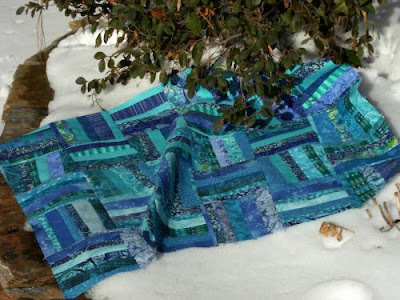 Hi Quilty Bird, You just go ahead and make one for yourself too!! I am so happy with the color combo. Another awesome string! Love the green and yellow combo and the blue is so cute. I like both of these too. 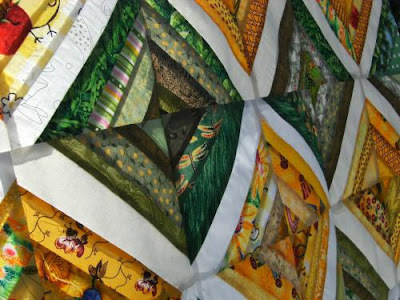 I don't use a foundation on my rail fence or log cabin type string quilts, just those pieced on the diagonal.